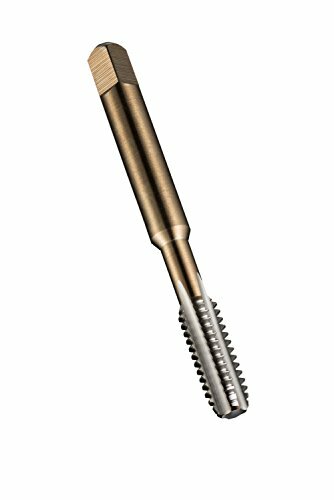 The Dormer E500/E513 uncoated, high-speed steel hand threading tap has straight flutes and a round shank with a square end, and is used to create metric right-hand threads in a range of materials. It is available in two different thread specification standards: Metric Coarse (M) or Metric Fine (MF). The straight flutes are suitable for threading through holes (extending through the workpiece) and blind or bottoming holes (with only one opening). Right-hand threads are designed to tighten when the head or nut is rotated clockwise (the most common threading direction). High-speed steel (HSS) is a common general-purpose steel for cutting tools and is compatible with a variety of materials. With no coating or surface treatment, this uncoated tool can be used on a broad range of materials and provides an economical alternative to coated tools. The round shank with square end makes it suitable for hand or power-driven applications. This tool can be used in machines, such as drill presses or lathes, or with hand tools such as tap wrenches. In the Dormer E500/E513 series, E500 taps are available in Metric Coarse (M) sizes; E500 taps with nominal diameters of 1 mm to 1.8 mm have two flutes, taps with nominal diameters of 2 mm to 12 mm have three flutes, taps with nominal diameters of 14 mm to 39 mm have four flutes, and taps with nominal diameters of 42 mm to 56 mm have six flutes. E513 taps are available in Metric Fine (MF) sizes; E513 taps with nominal diameters of 3 mm to 13 mm have three flutes, taps with nominal diameters of 14 mm to 39 mm have four flutes, and taps with nominal diameters of 40 mm to 50 mm have six flutes. Taps in both series are available with a variety of chamfers. This tap conforms to ISO 529 standards and can create threads to a depth 1 ½ times its diameter. It is suitable for the 6H tolerance class: 6H is used for a normal length of thread engagement and medium tolerance quality.